Have you ever wondered why being hungry can make you so cranky? This state of hunger-induced anger, or being “hangry” as it is sometimes called, is your body’s natural response to its need for food. When you eat food, the various components, such as carbohydrates and fats, are broken down into simple sugars, amino acids and so forth, which can be circulated through the body and used for energy. After a stretch between meals, the nutrient supply begins to decrease. When the level of glucose in your blood becomes too sparse, your brain interprets this as a life-threatening circumstance. This is because your brain needs glucose in order to properly function. You have most likely noticed at some point in your life that it is hard to focus attention and complete difficult tasks when you are hungry. It can also become difficult to monitor your social behavior and reactions. That is why people find themselves being cranky and snapping at others when they are hungry. People you are close to and would normally be relaxed around are more likely to be the target of your hangry behavior. “We found that being hangry can affect our behavior in a bad way, even in our most intimate relationships,” said Dr. Brad Bushman, professor of communication and psychology at Ohio State University and professor of communication science at VU University in Amsterdam. In an experiment conducted by Dr. Bushman, participants were given voodoo dolls to represent their spouses and pins. They were told to insert pins into the voodoo dolls depending on how angry they were with their spouse. Each participant was given a blood glucose meter and told to regularly measure blood glucose levels. The study findings showed that participants with lower blood glucose levels pushed more pins into the doll than those with higher levels. This was true, independent of the couple’s overall relationship satisfaction. Another part of hangry reactions is related to the glucose counterregulatory response that your brain triggers from blood-glucose levels that are too low. This response is how the brain activates different bodily organs to produce and release hormones that will increase glucose levels in the blood. cortisol from the adrenal glands. Two of those hormones, adrenaline and cortisol, are stress-related hormones that are frequently released by the body during stressful situations. In particular, adrenaline is the hormone most responsible for the fight-or-flight response that people experience when they are under extreme stress. A similar fight-or-flight reaction can be experienced during the glucose counterregulatory response because of the presence of these hormones. So this too can contribute to the angry behavior you may exhibit towards others when you need food. Another contributing factor towards angry behavior resulting from hunger is a gene called neuropeptide Y. This natural chemical is released in the brain during hunger; it induces feeding behavior and interacts with the Y1 receptor of the brain. 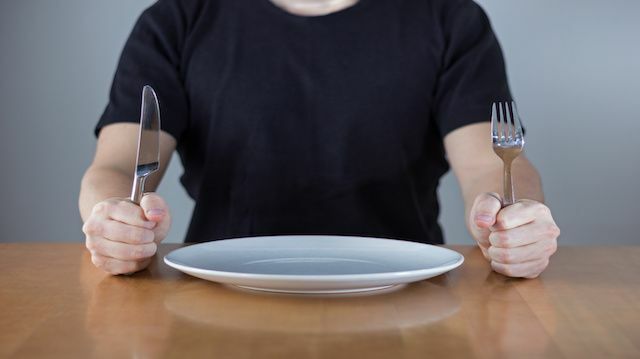 Neuropeptide Y and the Y1 receptor not only play a role in regulating hunger, but they also regulate behaviors such as aggression and anger. Research has shown that people with elevated levels of neuropeptide Y in their cerebrospinal fluid experienced elevated levels of impulsive aggression. A common mistake for people experiencing hanger is to reach for quick, convenience foods that are loaded with added sugars and simple carbohydrates. These junk foods cause quick, elevated spikes in blood-glucose levels that results in sudden crashes. This will only increase the body’s reaction to needing stable glucose levels and increase the hangry response. It is best to counter the hangry response with a meal that includes complex carbohydrates, proteins, and healthy fats. These nutrient-rich foods will return the blood-glucose levels to normal and last longer. We all suffer some hangriness from time to time, so plan ahead and keep convenient snacks in a purse or backpack. Especially on long car rides or outdoor activities, it is best to keep convenient, healthy food sources nearby. What are your favorite healthy, travel-friendly snacks? Previous article6 Dried Fruits That Are Actually Good for You! Hey Buddy!, I found this information for you: "This Is Why Hunger Makes You Cranky". Here is the website link: https://www.thealternativedaily.com/why-hunger-makes-you-cranky/. Thank you.